Mayor Steve Hagerty speaks at a meeting. Hagerty gave his first “State of the City” address on March 9, speaking to the community about the city’s achievements in environment, the economy and other areas, as well as future opportunities for growth and improvement. Mayor Steve Hagerty spoke to the community about the city’s achievements in the environment, the economy and other areas, as well as future opportunities for growth and improvement. About 300 people attended Hagerty’s first “State of the City” address as mayor. The event, which was hosted by the Evanston Chamber of Commerce and sponsored by NorthShore University HealthSystem, took place March 9 at the Holiday Inn Chicago North-Evanston. During the speech, Hagerty said the city is strong and that the jobless rate was down to 3.8 percent. More than 80 new businesses opened in the city last year, including North Shore Cider Company, Ovo Frito Cafe and two poke restaurants, he added. That day, Evanston was also officially recertified as a “4-STAR” community by the STAR Community Rating System — which measures and certifies sustainable communities, Hagerty said, adding that the city has reduced emissions by almost 20 percent compared to 2005 levels, and aims to reduce emissions by at least 28 percent by 2025 in accordance with the Paris Agreement. 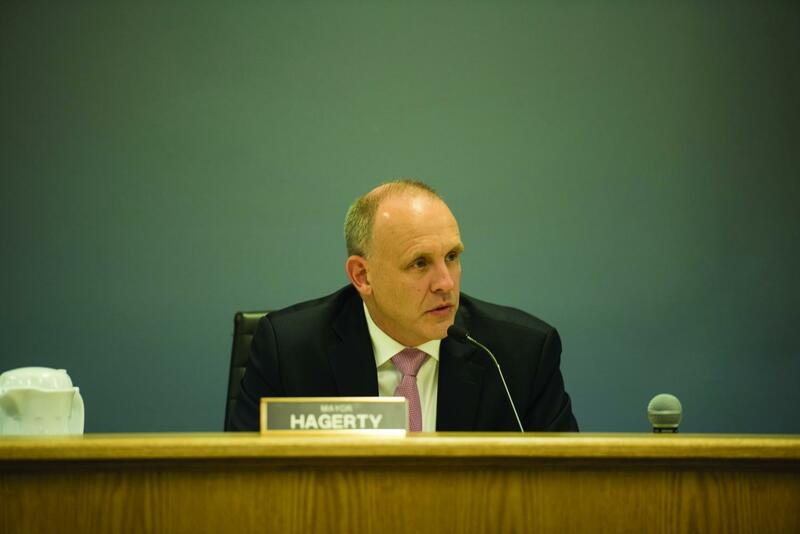 Hagerty said that “despite challenges,” the city’s budget is balanced for 2018, and that the council would begin to discuss the 2019 budget later this month — which he estimated is about six months earlier than when budget discussions normally begin. This past fall, Hagerty met with President Morton Schapiro to discuss Northwestern’s third straight donation of $1 million to the city’s Good Neighbor Fund. Hagerty said Friday forty-five percent of the donation will go towards improving city facilities and infrastructure, 22 percent towards supporting Evanston Fire Department paramedic services and 33 percent towards supporting Evanston youth and social services. Many organizations — including Northwestern, Evanston Township High School and the Youth Job Center — are working to support young people, Hagerty added, in areas like job training. Hagerty added that he was announcing the launch of Elevate Evanston — an initiative “uniting (the) community’s efforts” to connect people with job training and opportunities. The city is also exploring ways to expand options in affordable housing, Hagerty said, adding that the city would see more than 20 new affordable housing units and over $2 million added to the affordable housing fund because of projects approved in 2016 and 2017. Hagerty said that economic development is important because it helps the city increase its tax base without increasing taxes, allowing the city to retain its uniqueness and diversity.